PC World had a funny post about “fanboys”. 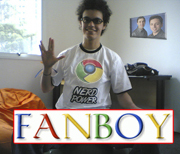 As I was reading it, I started to laugh because I actually know some people who would qualify as fanboys. PC World has several more descriptions, take a read, and see how many people in your life you can recognize. Overzealous fans are not limited to the tech world, just look at the nut jobs that obsess about Hollywood celebrities. So many people need to unplug for a while and take a serious assessment of their lives. It is crazy some of the discussions I have gotten myself into with over obsessed people. You can find the same kind of blind allegiance in extremes of both political parties. Those ones really keep me up at night. . .most people in the world need a serious vacation.